Paladins the Cause of Pollution? Mayor Tatania Karthina is excited to announce the arrival of a Stratics Reporter to the PaxOku Neighborhood. A structured called "UO Stratics Reporter Office, PaxOku" was seen in the preliminary stages of construction, just south-east of the Homare-Jima Moongate, along the road. The owner was signed as "Kirsten Relic" and is known to be the newest Reporter for the Stratics Network. Although she was unavailable for comment, her home, as of the writing of this article, was sparsely furnished and maintained a new design to it, with paint still drying on the walls. Mayor Karthina was excited about her new neighbor and looked forward to meeting her in the future. Welcome to the PaxLair neighborhood Kirsten! Beloved citizen Lenora has returned to PaxLair! Lenora was spotted roaming the streets of PaxLair looking for some activity. She was successful in her hunt as she was able to cross paths with Tatania Karthina, John Duke, Ga'kuct, and the despicable Cross MacLeod. I was able to ask Lenora a few questions before having to go clean the Orcs' trophy skulls. She indicated that she planned an extended stay in PaxLair and was originally located in Yew, until her services were no longer required. Orcs and Paladins Working Together? Strange news has broken from PaxLair City as it was reported a possible alliance has been established between the Paladins and the Orcs. The news had ignited from the claims that a "murderer" was seen roaming the streets of PaxLair, one sought for crimes against fellow citizens of the realm. The murderer known as Crazy K was spotted roaming the streets of PaxLair looking for potential prey. Preliminary reports indicate that PaxOku Mayor Tatania Karthina and a visitor of PaxLair known only as Mark were struck down by the felon. Mayor Warboss Ga'kuct and Cross MacLeod of the Paladins of Virtue struck into action on different paths, but were unable to down the fiend. It wasn't until they began to work together that justice was served. Governor Winfield has declared the "UO Automap Server Link" as the official PaxLair Statehood communication system. He said, "Our citizens and friends are constantly spread out throughout the Realm. We do not have a single alliance or guild to stay in close contact with each other. We have 5 cities to visit along with hundreds of places to wander about in the Realm. It is a chore to stay in touch and find each other quickly. "Therefore, the ethereal UO Automap Server Link can solve these problems and make our lives much easier. Through this, we can quickly locate and chat with each other anywhere in the Realm. I am personally on the Link as much as I can ... whenever I am fishing, in Statehood meetings, or supporting a Call to Arms. Everyone on Chesapeake may use our Link and do not have to be a citizen of PaxLair." The Server Information is provided below. 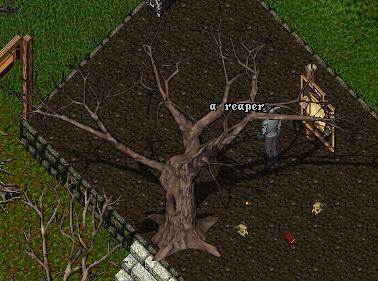 The reapers of PaxLair have had a long standing feud against...everything. They spring up and attack anything and everything nearby. Such hostile plants can only be a device of some evil magics, possibly conjured up by Cross MacLeod. Nevertheless, the beings were always defeated upon creation. The reapers, however, have recently developed a new tactic within PaxLair. The reapers of PaxLair are now evaluating and determining whether to buy land in PaxLair, so that they may no longer have to fight for it. This recently spotted reaper (to the right) was seen looking at the plot of land south of the Spring of Courage, which is currently for sale by the owner. It seemed to dig in well with the ground but still looked rather angry, so I only stealthed around it cautiously. Demz wylz bi treetid lyk angee uddir perzun en Paxuzg. Ib demz ib kaut helbin da hutlezz, demz wylz bi clompid. Eberiash shud keeb demz peepirz oben en kaze demz ib wurkin wyph da brufz. Gak wylz keeb Gakz peepir un demz. Ull ogh latz shud uz kaushun wen blahin wid da shrubz. Warboss Mayor Ga'kuct has 5 more questions ready for answering. This week's questions focus on the invasion occurring on the border of PaxLair, and maintains a strong resistance to the long standing (IGM)Orc Fort. It also contains warnings to those that try to fool the orcs in April, and to those who seek to be their enemies. On March 31st, 2007, the PaxLair Community celebrated the binding of two of its most prominent citizens. Mayor NANOC and Vice-Mayor Phoenix, both of DragonÃ¢â‚¬â„¢s Watch, solidified their love by joining in matrimony. The Wedding was held on the Northern Altar of Maginicia, Trammel, and was witnessed by well over 20 citizens of the Chesapeake Shard. Despite rumors of an invasion of little Neo of Lothlore off springs (Neolytes, as they like to be called) the wedding went off without a hitch as well as the following Wedding party which was gathered at the Hall to the west. Congratulations NANOC and Phoenix, and bright futures to you from everyone!! Treachery! The beastly fiends! Nevyn and his crew have found undeniable proof that Savages have taken Kerrs Holly! The only thing left is the cutlass Kerrs held. The horror of this news is unsettling to the DAGR crew. Most who knew him were aware of the long standing rancor against the Savages, despite the Savage Ale brought back by Greyylene. There is some degree of suspicion as to the validity of the account brought back by the USN envoy. DAGR and USN have come to a temporary truce to battle with the Juka as a united front against the common enemy, however the not so distant past warrant for Kerr's is not forgotten by either side. It is said the look on Nevyn's face when he reported the incident was of some degree of horror and sorrow, perhaps it is sorrow at not having been able to take the Pirate himself. Town's people across the land met this news with mixed emotions. One full town threw a party complete with a parade at the news of no longer being raided by the notorious pirate. Others reactions are filled with suspicion and disbelief, those towns where the brothels lie and the bar tenders will miss his ale and gold not to mention the stories of his adventures. It is a grave loss for our DAGR guild! A memorial service will be held as soon as we have remains returned to our Island. Long Live the Memory of Kerrs Holly of the DAGR Pirates! !